It's that time again. 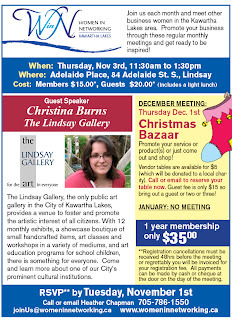 Thursday, Nov 3rd is our next WiN meeting and Christina Burns from the Lindsay Gallery will be our guest speaker. Please let me know if you will be attending. Full details below. Please let me know too if you are interested in a vendor spot for the December Christmas Bazaar (open to all memebers). Important: Please remember that on meeting day the only parking available is along Adelaide Street. What a great meeting we had today! I always walk away feeling inspired and energized and all it takes is spending two short hours with such an incredible group of women! A quick thank you to Adrienne, the staff and residents of Adelaide Place for inviting us into their home and providing us with a wonderful meeting place and delicious lunches! I know this week was especially trying but you did an amazing job as always! Thank you, thank you thank you! Thanks to Susan Peirce of Sunrise Graphics for helping me with the 50/50 draw and congratulations to Darlene on her winnings! Finally thank you to Joyce McCulloch for her very informative talk on FreeLife's Health and Wellness products!